The Rio de Janeiro favelas, where life pulses to a different beat, lie beneath the glitz and glamour of this beautiful city. They stretch as far as the eye can see, turning the city's landscape into a colorful patchwork of shoddily constructed shanties. Interesting Secret #1 - Rio de Janeiro favelas vary greatly in size, and many are complex urban communities.The Rio de Janeiro slums are not just for temporary squatters. Some shanty towns are so large that they are almost small cities within a bigger city. About 250,000 call Rocinha, Rio's largest slum, home. They have their own schools, community projects, hundreds of businesses, and even a bus transportation system. Others are tiny communities. Vila Canoas is the smallest favela with about 2,500 residents, all of whom are proud of the small and intimate environment they live in. Over a million people live in 750 favelas. In fact, one out of five people who call Rio de Janeiro home resides in one of these settlements. Interesting Secret #2 - Rio de Janeiro slums attract thousands of tourists. The majority of Rio's residents see the neighboring favelas as dark, violent places that drag down the reputation of their city. Few ever venture there. Foreigners, on the other hand, find some aspects of the slums endearing. The uninhibited energy of the locals and the lives they lead fascinate newcomers. There is a touch of romance in these crowded, shoddily constructed communities that attracts people interested in experiencing the real Brazil. Interesting Secret #3 - There are plenty of hardworking, honest people living in Rio de Janeiro favelas. The slums of Rio are infamous for powerful drug lords and brutal gang warfare. While there is certainly truth to that, not everyone who calls them home is a criminal. Many make an honest living, going to work every day and supporting their families. People choose to live in favelas for many different reasons ranging from having roots there to desiring a shorter commute. The one thing they have in common is their "Bairrismo," a sense of tremendous pride in their backgrounds and communities. Interesting Secret #4 - Speaking volumes about the vibrant spirit of their residents is the fact that all of Rio's samba schools are located in the Rio de Janeiro slums. Thousands of people are drawn to them not just to learn to dance, but to also feel a unique sense of belonging and mutual respect. Interesting Secret #5 - Rio de Janeiro favelas are not segregated from Rio's more affluent neighborhoods. Sometimes the shanties belonging to the slums rub shoulders with villas belonging to an entirely different world. 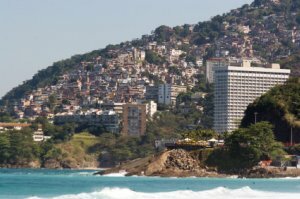 Because shanty towns are often located in places with breathtaking views, they often share them with Rio's wealthier residents. The Rio de Janeiro slums suffer from a bad reputation as violent places, abandoned to drug lords and criminals. They certainly can be dangerous, but it's not fair to dismiss them altogether. In every slum, there are plenty of friendly, hardworking locals who are as much a part of Rio's culture as their wealthier neighbors.